BOSTON, Mass. 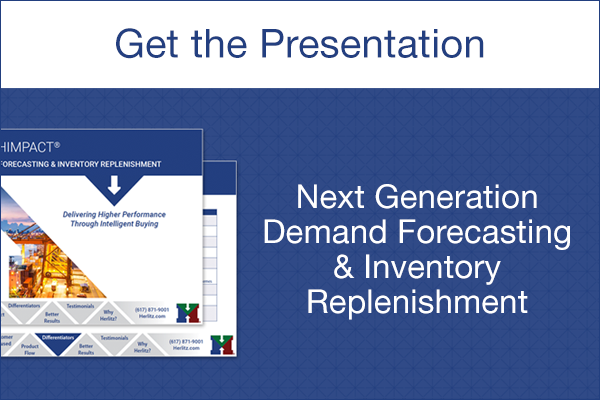 (August 4, 2015) – Herlitz Inventory Management, leading innovator in scientific demand forecasting, replenishment and optimization, is pleased to announce an aggressive initiative to help retailers and wholesalers transition from their legacy E3TRIM and E3SLIM forecasting and replenishment solutions to HIMPACT, Herlitz IM’s advanced supply chain solution. In the second half of 2014, competitor JDA Software Group, Inc., relocated its customer and product support for Advanced Warehouse Replenishment (AWR) and Advanced Store Replenishment (ASR) to their Asian support center. Since then, companies have approached Herlitz IM with the need to improve customer service and replace their legacy-based 1990’s inventory management systems. In response, Herlitz IM has developed the E3 Migration Kit, a simple proven program that allows a quick conversion from older legacy systems to their latest solution, HIMPACT. Current E3/AWR/ASR customers can use existing interfaces, which allow for a quick conversion in days, not months. The migration kit includes a detailed transition plan and ongoing consultation with Herlitz IM conversion experts. In addition to the E3 Migration Kits, Herlitz IM has developed a conversion kit for INFOREM users, along with establishing multiple interfaces for JD Edwards, Entrée, VIP (versions 8, 10 and 11), Bev-Pak, Liquor POS and Target Data Systems. Founded in 2009, Herlitz Inventory Management (Herlitz IM) provides tightly integrated Demand Forecasting, Order Optimization, Promotion and Forward Buying. Herlitz innovative designs are an industry standard; used by thousands of companies to optimize their inventory. With end-to-end visibility and new insights, HIMPACT is uniquely suited to today’s marketplace, delivering optimized buying quantities, highly satisfied customers and tighter inventory management. AWR, ASR, E3, E3TRIM, E3SLIM& INFOREM are trademarks of JDA Software Group, Inc. All other trademarks are the property of their respective owners.